Anyone who ever visited Mai Chau in Hoa Binh Province never forgets the rolling landscape or the friendly, charming nature of the local Thai and Mong people. 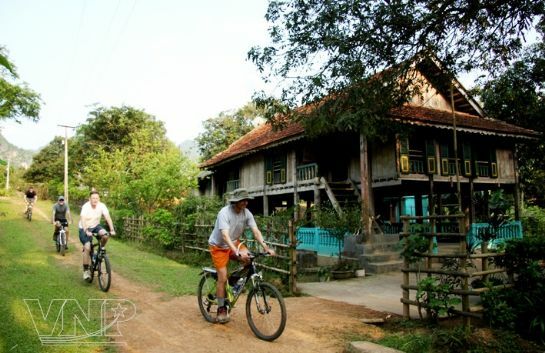 Mai Chau Lodge is a four-star hotel which was built in the style of a typical house-on stilts of the Thai ethnic people in the Mai Chau Valley. From the window of the hotel, one can behold the beauty of peaceful hamlets, green lakes, romantic hillsides and the ever stretching rice fields swaying in the fresh mountain breeze. Foreign tourists during a tour by bike to hamlets in Mai Chau Valley. The Bong dance performed by Thai girls. in Lac and Pom Coong Hamlets. Brocade-making craft of Thai ethnic people in Pom Coong Hamlet. Tourists photograph and video the artists performing the traditional Sap dance. A Mong elder performs on bamboo flute. A stall selling brocade items of Mong ethnic people attracts great attention from tourists. Tourist visit Lac Hamlet and learn about the colours of brocade products of Thai ethnic people. The beautiful landscape of the ever-stretching rice fields in Mai Chau Valley. Lac and Pom Coong Hamlets are typical of Thai minority communities. The houses are built on stilts, 1.5m above the ground, having bamboo floors and roofs made from Goi or May leaves. The area under the house is usually reserved for livestock, but for the sake of the tourists, at some houses this area has been converted into a souvenir shop flaunting items such as shawls, dresses, bags, purses, brocade cloths and multi-colour cloth balls skilfully made by Thai ethnic people. In some houses tourists can witness local women diligently working at a loom, weaving colourful brocade fabric. Also, a visit to a local hamlet is not complete without trying the famous Can wine (wine drunk out of a jar through pipes) that is made from sticky rice, Hinh ho leaf, Meo leaf and ginger that fascinates any visitor. Continuing on to the tour with the next destination of Hang Kia Commune, tourists will enjoy melodious tunes of flute and mingle in the life of locals at Pa Co market where they can buy typical products of Mong ethnic people as presents for relatives and friends. Then they will visit Mo Luong Cave which is famous for mysterious stalactites in different shapes of flowers and springs. Tourists are encouraged to stay at homes of local families and enjoy a special artistic programme with fascinating dances and songs of Thai ethnic people. After dances of gongs, Xoe, Gia gao and Xoe quat, they will be invited to participate in a Sap dance with the locals. Overnight stays in homes floating on the lake are also available, where one can take in a gorgeous sunrise and enjoy the clean and pure atmosphere of the early morning.